Click on the photo and see all the photos of Seascape Holidays-14 Mediterranean. 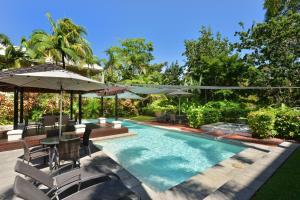 Located in Port Douglas in the Queensland region, Seascape Holidays-14 Mediterranean features a terrace and pool views. Popular points of interest near Seascape Holidays-14 Mediterranean include Crystalbrook Superyacht Marina, Marina Mirage and Rainforest Habitat Wildlife Sanctuary. Cairns Airport is 52 km away. Please note that the check-in and key-collection take place at: Shop 9, 50 Macrossan Street Port, 4877 Port Douglas. This property will not accommodate hen, stag or similar parties.